The TJAOM Knowledge Translation Task Force is pleased to share with you the TJAOM Toolkit. The purpose of the toolkit is to provide clinicians with outcome measures appropriate for use along the continuum of care for patients before and after total joint arthroplasty. The development of this toolkit is one of multiple Physical Therapy Knowledge Broker projects (including the Achilles Tendinopathy Toolkit and the Lateral Epicondyle Tendinopathy (Tennis Elbow) Toolkit) supported by the UBC Department of Physical Therapy, the Physiotherapy Association of BC, the Vancouver Coastal Research Institute, and the Providence Healthcare Research Institute. The following information is current as of February 2015. Use the Discharge Letter Template and Appendices to communicate the results and interpretation with the physician. The purpose of this document is to provide evidence-based guidance (evidence derived from a survey, chart audit, focus group, Delphi process and the literature) regarding the most appropriate outcome measures (OMs) to use for patients along the continuum of care for Total Hip Arthroplasty and Total Knee Arthroplasty. The selection of how many and which OMs to use is at the discretion of the clinician based upon the unique contexts of the practice setting. 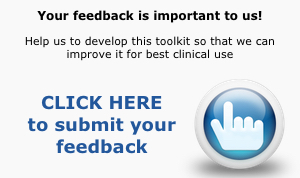 The toolkit contains these one page summaries to encourage you to review the information for the outcome measures that you selected and to review the instructions of how to do the test from the link provided in the section “How do I do it?”. Online learning modules for each recommended outcome measure are currently being developed. These learning modules will provide the step by step process to apply, score and interpret each of the recommended outcome measures. Use the Discharge Letter Template and Appendices to communicate the results and interpretation with the physician. Read “How to use the Total Joint Arthroplasty and Outcome Measures (TJAOM) Discharge Letter Template and Appendices”, customize the letter with your clinic/organization’s logo and address and cut and paste the outcome measures and suggested interpretation statements that are relevant for the patient. ↑ 1.0 1.1 1.2 1.3 Dobson F, Hinman RS, Roos EM, Abbott JG, Stratford P, David AM, Buchbinder R, Snyder-Mackler L, Henrotin Y, Thumboo J, Hansen P, Bennell KL (2013). OARSI recommended performance-based tests to assess physical function in people diagnosed with hip or knee osteoarthritis. Osteoarthritis Cartilage; 21:1042-52. ↑ 2.0 2.1 2.2 Alviar MJ, Olver J, Brand C, Hale T, & Khan F. (2011) Do patient-reported outcome measures used in assessing outcomes rehabilitation after hip and knee arthroplasty capture issues relevant to patients? Results of a systematic reviewfckLR nd ICF linking process. J Rehabil Med; 43(5):374-81. ↑ 3.0 3.1 3.2 Alviar MJ, Olver J, Brand C, Tropea J, Hale T, Pirpiris, M, Khan F. (2011). Do patient-reported outcome measures in hip and knee arthroplasty rehabilitation have robust measurement attributes? A systematic review. J Rehabil Med; 43:572-83. ↑ 4.0 4.1 4.2 Collins NJ & Roos EM (2012). Patient-Reported Outcomes for Total Hip and Knee Arthroplasty: Commonly Used Instruments and Attributes of a “Good” Measure. Clin Geriatr Med; 28:367–94. ↑ 5.00 5.01 5.02 5.03 5.04 5.05 5.06 5.07 5.08 5.09 5.10 5.11 5.12 5.13 5.14 5.15 5.16 5.17 5.18 5.19 5.20 5.21 5.22 5.23 Westby MD, Brittain, A, Backman CL (2013). 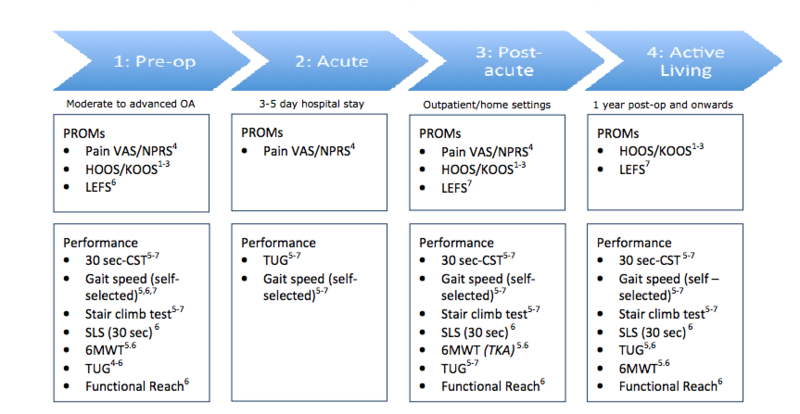 Expert consensus on best practices for post-acute rehabilitation after total hip and knee arthroplasty: A Canada-US Delphi study. Arthritis Care Res. Sep 10. Epub ahead of print. ↑ 6.00 6.01 6.02 6.03 6.04 6.05 6.06 6.07 6.08 6.09 6.10 6.11 6.12 6.13 6.14 6.15 6.16 Hawker GA, Mian S, Kendzerska T, French M (2011). Measures of adult pain. Arthritis Care Res. 63(Suppl 11):S240-52. ↑ 7.00 7.01 7.02 7.03 7.04 7.05 7.06 7.07 7.08 7.09 7.10 7.11 7.12 7.13 McAuley C, Westby MD, Hoens A, Troughton D, Field R, Duggan M, Reid WD (2014). A survey of physiotherapists' experience using outcome measures in total hip and knee arthroplasty. Phys Can. Jan 21. Epub ahead of print.